Today the Wildwood’s answer to Temperance comes out to join us. This is my central card of the year for my New Year Spread, so I am getting quite familiar with it. What does it say to you? For me, it’s another balance card and the big one at that. So it could be that today is a big balancing day. It can go one way or another, but the trick is to chance your balance to counteract it. Far easier said and typed out than done, I know! Especially if you cannot see the table you’re on or which way it is currently pivoting. Like these two snakes (or are they dragons? 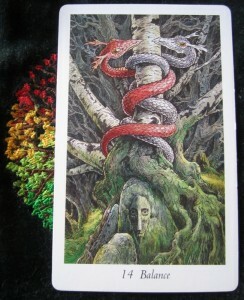 The book says serpents) winding their way up the trunk of a silver birch. 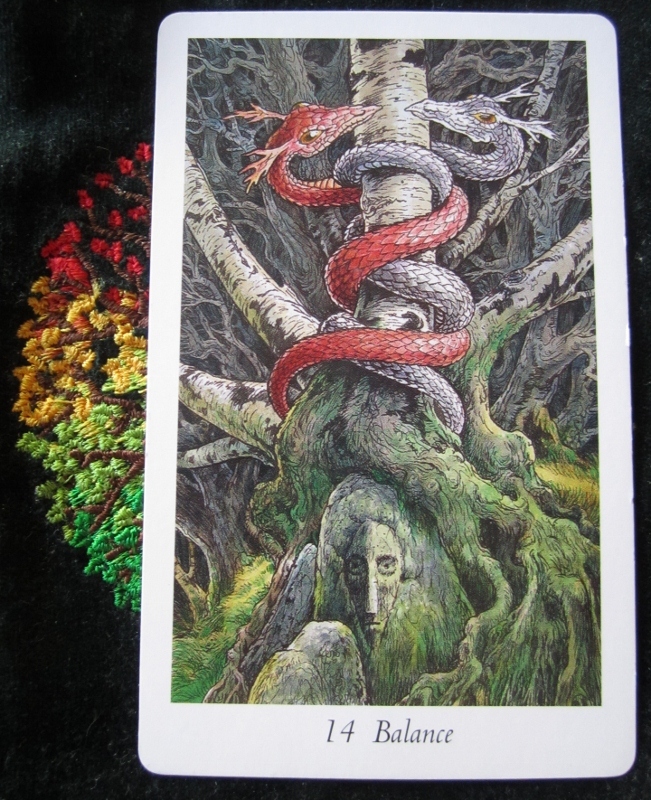 The other side of this card (and having just read this in the book, makes this year a lot of sense so very suddenly!) is patience. It’s never been my virtue, patience. I’d rather get on and get it done, now. Oh well, only six more months of the year to go! However, for today, a serious dose of patience, contemplation and calm. (Have you ever tried to be calm when you’re the mother of two children?) However unpleasant it may be, investigating your own psyche is part of the deal. In order to move forward, you and all facets of you, need to be in balance. It’s necessary if you’re to move onto the next stage. So for today, the message seems to be to keep things in balance, reflective and calm. Something of a tall order, even for a Monday.